Our Abpromise guarantee covers the use of ab52234 in the following tested applications. WB 1/300 - 1/1000. Detects a band of approximately 24 kDa (predicted molecular weight: 24 kDa). 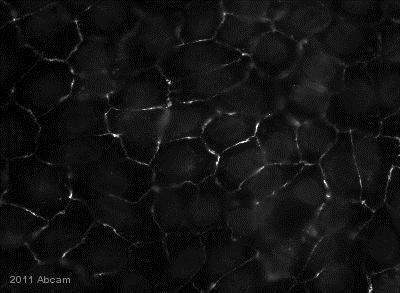 Lane 1 : Extracts from LOVO cells, untreated. Lane 2 : Extracts from LOVO cells, treated with the immunising peptide. 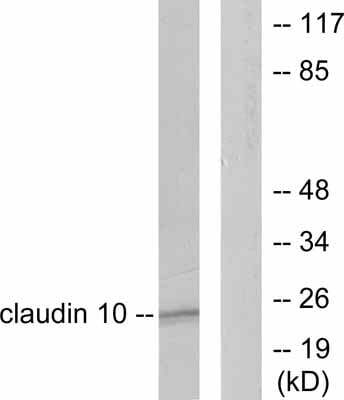 Immunohistochemistry (Formalin/PFA-fixed paraffin-embedded sections) - Anti-Claudin 10 antibody (ab52234)This image is courtesy of Anonymous Abreview. ab52234 staining Claudin 10 in sections of Human proximal tubular cells by Immunohistochemistry (Formalin/PFA-fixed paraffin-embedded tissue sections). The sections were fixed in methanol prior to blocking with 5% BSA for 30 minutess at 20°C. The primary antibody was diluted 1/300 in 0.5% BSA/0.1% Triton X-100 and incubated with the sample for 1 hour at 20°C. An Alexa Fluor® 488-conjugated Donkey anti-Rabbit polyclonal was used as the secondary antibody, diluted 1/800. Publishing research using ab52234? Please let us know so that we can cite the reference in this datasheet.